I was in South Shields today as part of a Property Care Association team of examiners. The PCA group included Mike Bromley and David Hockey. 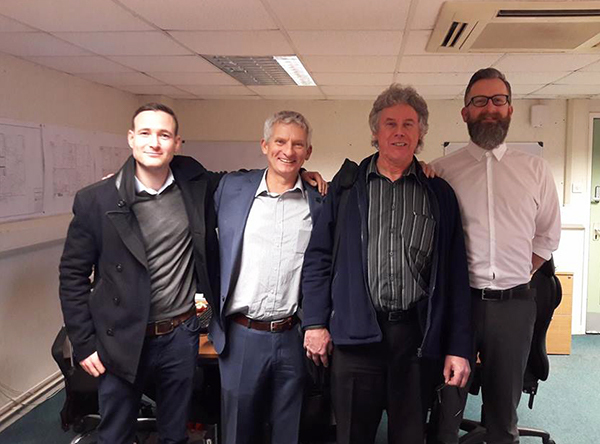 Our venue was South Tyneside Homes in South Shields, where there were ten staff sitting the timber infestations module of the Certificates Surveyor in timber and damp in buildings examination (CSTDB). CSTDB is a three-module examination, including this timber based session, as well as a dampness in building and health and safety module. The timber module is a daunting one, including extensive sections on timber physiology; surveying; entomology and mycology. Students have to know their hardwoods from softwood, woodworm for bark borer and wet rots from dry rot. In addition, they face a two-man grilling which is the famous oral (David and I this time). That’s not all though – students are presented with a dozen timber samples, infested with a wide range of ‘nasties’ including different insects and fungi. These timbers need to be identified correctly. Orals are designed to test candidate’s real-world knowledge, by presenting them with case studies and scenarios to see how they cope. This is my favourite bit because in our industry, practical and academic skill go hand in hand, so a written examination on its own, just wouldn’t do. Chatting about infestations, sites and treatment options can open-up a person who may feel stifled in a written environment. Conversely, a gifted writer and academic who thrives in exams may stumble when faced with evolving arguments face-to-face. This broad examination approach is part of the reason CSRT (the forerunner of CSTDB), has come to be recognised as the ‘must have’ qualification for timber and damp specialist surveyors. PCA go to great lengths to maintain rigorous standards. This ensures that those who work hard enough to obtain CSTDB, can be proud of their achievements and be sure their work is recognised across the industry. Examiners don’t know everything! South Tyneside Homes manager Craig, offered me something called a ‘Saveloy Dip’. I was dubious, but being from Yorkshire I wasn’t going to say no to a free ‘sandwich’. 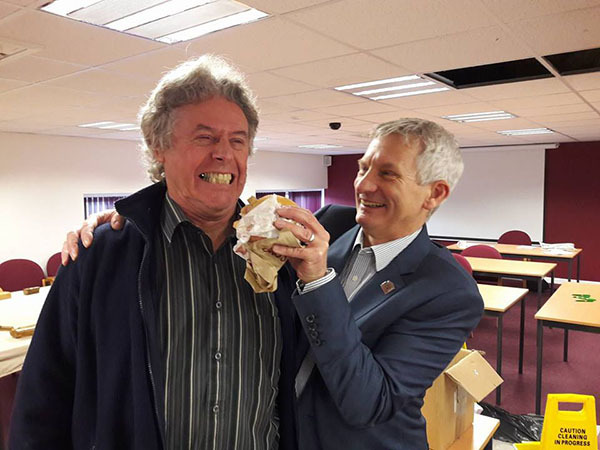 Mike Bromley isn’t sure about the Saveloy Dip… Bryan has other ideas…. Craig presented me with what can only be described as a dead man’s hand in a sandwich – the sausages (The ‘Saveloys’ reminiscent of fingers – the dip, a Pease pudding with a pus-like colour and texture) …. I twas delicious! These guys know their rots! Thank you to the team at PCA for organising the day and especially to all those in South Shields who worked so hard and took the exams with us today – well done. You all made David, Mike and I’s trip a real pleasure. It’s not over yet, with damp modules to come. I’m sure that there will be success and disappointment by the end of the process. For those who pass – welcome to a growing club of specialists whose knowledge has been validated by examination. If the news is lees good – don’t despair, exams and modules can be re-taken, knowledge gaps filled and lessons learned. Don’t give up. For the tastiest Saveloy dip – get the one I sampled from Dicksons. Great work by you all. I’m delighted to see you in my neck of the woods. It was good fun. Some great candidates too and the Saveloy Dip was ace! Copyright © 2010 Preservation Expert. Legal Stuff: All the advice and information in the posts on my blog is made in good faith and is based on my experience and knowledge at the time of writing. However, nobody is infallible and whilst I’m confident that most of what I write about preservation issues is accurate, there’s a good chance there’ll be an error or two somewhere. I do change my mind about stuff, as I gain more experience. In view of this you must make your own decisions on whether to follow any advice I write and think about this; I could be wrong. No responsibility will be accepted by the author for any losses anyone may suffer as a result of any mistake or for the consequence of any action you take as a result of reading this blog. If you do suffer a loss, resulting from anything I’ve written, a verbal heartfelt apology will be your only compensation.